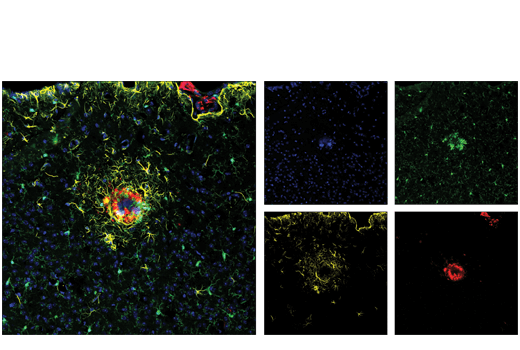 Confocal immunofluorescent analysis of mouse Tg2576 brain, which overexpresses mutant human APP695. Sections were labeled with ASC/TMS1 (D2W8U) Rabbit mAb (Mouse Specific) (Alexa Fluor® 488 Conjugate) #17507 (green), GFAP (GA5) Mouse mAb (Alexa Fluor® 555 Conjugate) #3656 (yellow), and β-amyloid (D3D2N) Mouse mAb (Alexa Fluor® 647) (red). Samples were mounted in ProLong® Gold Antifade Reagent with DAPI #8961 (blue). β-Amyloid (D54D2) XP® Rabbit mAb (Alexa Fluor® 647 Conjugate) recognizes endogenous levels of total β-amyloid peptide (Aβ). The antibody detects several isoforms of Aβ, such as Aβ-37, Aβ-38, Aβ-39, Aβ-40, and Aβ-42. This product detects transgenically expressed human APP in mouse models. Monoclonal antibody is produced by immunizing animals with a synthetic peptide corresponding to residues near the amino terminus of human β-amyloid peptide (Aβ). This Cell Signaling Technology antibody is conjugated to Alexa Fluor® 647 fluorescent dye and tested in-house for direct immunofluorescent analysis. The antibody is expected to exhibit the same species cross-reactivity as the unconjugated β-Amyloid (D54D2) XP® Rabbit mAb #8243. Amyloid β (Aβ) precursor protein (APP) is a 100-140 kDa transmembrane glycoprotein that exists as several isoforms (1). The amino acid sequence of APP contains the amyloid domain, which can be released by a two-step proteolytic cleavage (1). The extracellular deposition and accumulation of the released Aβ fragments form the main components of amyloid plaques in Alzheimer's disease (1). APP can be phosphorylated at several sites, which may affect the proteolytic processing and secretion of this protein (2-5). Phosphorylation at Thr668 (a position corresponding to the APP695 isoform) by cyclin-dependent kinase is cell-cycle dependent and peaks during G2/M phase (4). APP phosphorylated at Thr668 exists in adult rat brain and correlates with cultured neuronal differentiation (5,6). Selkoe, D.J. (1996) J Biol Chem 271, 18295-8. Caporaso, G.L. et al. (1992) Proc Natl Acad Sci USA 89, 3055-9. Hung, A.Y. and Selkoe, D.J. (1994) EMBO J 13, 534-42. Suzuki, T. et al. (1994) EMBO J 13, 1114-22. Ando, K. et al. (1999) J Neurosci 19, 4421-7. Iijima, K. et al. (2000) J Neurochem 75, 1085-91.